If you are reading this article you probably already know the truth about agave and avoid foods containing High Fructose Corn Syrup (HFCS). But just as John Q. Public is learning that this is actually very bad for you, the commercial food industry has discovered something even better to fool us with — and it’s targeted right at the health-conscious consumer! Welcome to the world of agave nectar — a diabetic friendly, raw, and 100% natural sweetener. Except that’s completely UNTRUE! High Fructose Corn Syrup Is Bad for You! 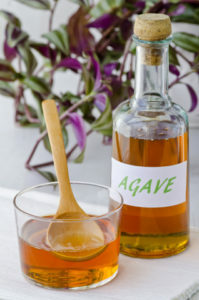 Today, agave nectar is found in the health food aisles of many supermarkets. It’s also be found as an ingredient in many foods labeled organic or even raw, from ketchup and ice cream to chocolate and healthy snacks. The labels on these products are designed to make you think that agave is a natural unrefined sweetener that has been used by indigenous peoples in Mexico for thousands of years — but that’s just a sad joke given the actual history of agave. While it is true that a long time ago in Mexico they used the sweet sap from the Pina (top of the plant), the agave nectar in stores today is a relative newcomer to the world of artificial sweeteners actually invented during the 1990’s. The “Blue Agave” that you find in stores now isn’t even made from the sap or nectar of a real agave plant, as the original white agave was. 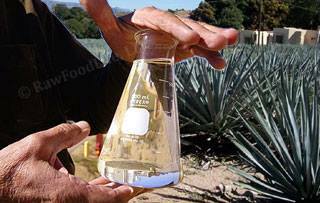 Instead, Blue Agave is processed by removing the root or bulb of the plant, then treating it with chemicals and processing beyond all recognition! The traditional Agave Salmiana (White Agave) associated with health benefits is made much more naturally — and tediously. It is very rare today. Agave Salmiana grows a flower from the center of the plant called the Quiote. The Quiote is cut off when the plants is 7-8 years old, creating a hole or pool of liquid in the center of the plant, called “Aguamiel.” The plant is then milked twice daily as the Aguamiel collects. Aguamiel is not the “sap” of the leaves as is some commercial sources like to claim. In fact, the sap from the leaves is actually inedible — containing saponins, raphides and calcium oxalate. Aguamiel is the juice that the plant makes to feed the Quiote, so is full of nutrients like carbohydrates, fructans, vitamins and amino acids. The removal of the water in the Aquamile juice leaves White Agave nectar — the healthy, traditional agave that’s almost impossible to find and very expensive. Even if you do locate some, it still has far too much fructose for most people. It is also quite acid-forming for your body. Because high fructose agave syrup won’t spike blood glucose levels, some ruthless companies promote agave syrup as a good alternative for diabetics! For this they should probably be criminally prosecuted! Of course fructose doesn’t trigger a test for glucose – but that doesn’t actually make it a healthy substitute even for diabetics! Unlike glucose, which is metabolized by the pancreas, fructose is metabolized by the liver just like alcohol and produces many of the same side effects as chronic alcoholism! That can include mineral depletion, liver inflammation, hardening of the arteries, insulin resistance & diabetes, high blood pressure, cardiovascular disease, obesity, stroke, cancer, arthritis and premature aging. Yucca plants also contain saponins – highly toxic steroid derivatives. Yet this nasty, unscrupulous industry actually tries to claim that saponins have some ridiculous health benefits,. However, you should avoid them at all costs, especially if pregnant or breastfeeding! If you want something sweet, eat a piece of fruit. Even raw organic snack bars are loaded with processed sugars. I say that because even drying fruit in the sun is actually a form of processing! Dried fruits are sources of highly concentrated sugars and can be almost as bad as any other kind of sugar. Now, of course that is an ideal. You might have to work up to it, since most people are addicted to everything tasting sweeter than it really needs to. Also, your body may have adapted to an emergency form of cellular metabolism that relies more on glucose, since that is all you have been eating for decades. Instead, here are a few alternatives — though eliminating your need for sweet things is really the best long term strategy. Until then, for raw dishes try using raw honey or dates. For cooked dishes try organic maple syrup. For an occasional desert use dehydrated cane sugar juice or maple sugar in moderation. Freshly made apple juice or orange juice can also provide plenty of sweetness – but remember, juicing sweet fruits is also a form of processing that concentrates sugars so should be used in moderation. If you must use agave, look for traditional raw, organic agave if you can find it. But here is the bottom line — ultimately all sweeteners are bad and acidic-forming to your body just like cooked food. Healthy food actually taste wonderfully naturally once you are used to the natural taste of food. When you alter the way foods taste you actually confuse your ability to know “intuitively” what’s good and what’s not. With a raw, live food diet, after a period of cleansing and healing at the cellular level, your natural ability to taste real food begins to return. That’s when live, fresh foods begin to taste wonderful without any enhancement. After that, if you have a craving its no longer your addictions calling, it means your body actually has a real nutritionally need. When you eat fresh, organic raw food it doesn’t come with fine print on the label that can be distorted and twisted by greed. Every single new sweetener like agave syrup introduced into the market was invented to do one thing – make a profit for a corporation. Since the FDA doesn’t enforce food-labeling laws, you can’t be sure what you’re eating is what is on the label of any processed food. So please, just don’t eat that junk! Reduce Your Consumption of Fructose and ALL artificial sweeteners!